BRUSH CUTTER, LITTLE WONDER 26"
DIMENSIONS (LxWxH).. 78" x 32" x 42"
CUTTING HEIGHT......... 3" to 5"
THE MAXIMUM OPERATING SLOPE IS 20 DEG. FRONT TO BACK & SIDE TO SIDE. The LITTLE WONDER HYDRO BRUSH CUTTER navigates through weeds, heavy brush and overgrown vegetation with ease. Tempered spring steel 26" blade cuts tall weeds, brush, and saplings up to 1" thick. The hydrostatic transmission offers infinitely-variable, clutch-less speed selection of up to 4 mph forward and 1.5 mph reverse. So you can cut your own path at your own pace. 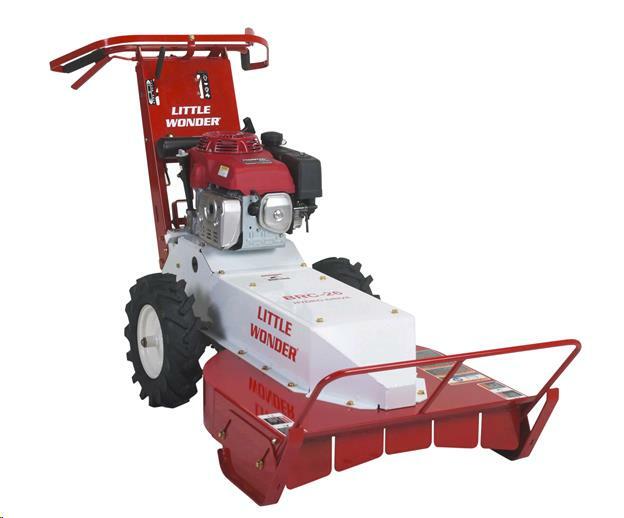 ** Please call us for any questions on our brush cutter little wonder 26 inch rentals in Fairview Heights IL.